I have written several times about my mother’s Swedish mom, Elva. She was born on the 11th day and the 11th month in 1911, and was the eleventh child, thus the name Elva-11 in Swedish! She was a feisty lady who loved to cook and bake! I felt she was like a movie star and people came to visit her always raving about her sweet treats! She made cakes, pies, caramels and Swedish breads as well! But mostly I remember her Swedish cinnamon rolls and her maple bars. 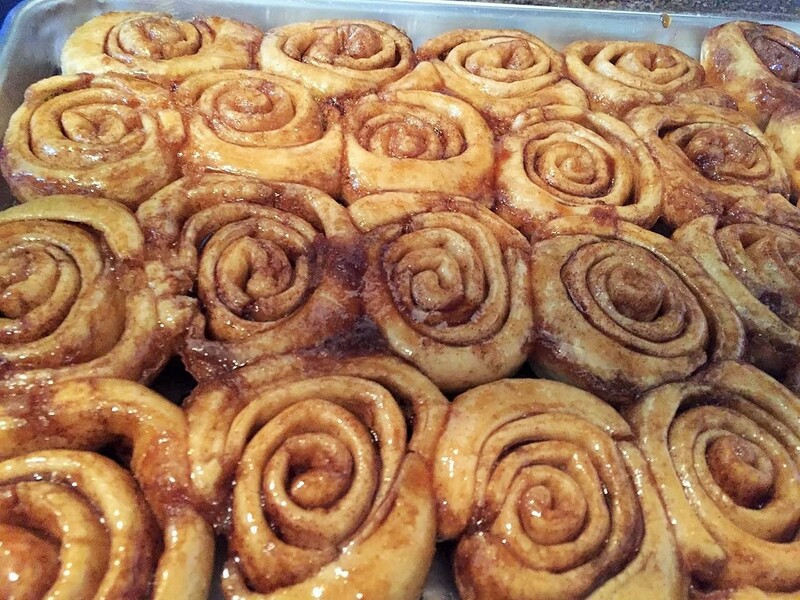 When I was married and started doing allot of baking, I decided to try her famous cinnamon rolls. I used her recipe and followed the instructions carefully, taking them out of the oven when they were lovely and golden brown. The brown sugar and cinnamon aroma brought me back to Elva’s Swedish kitchen. I let them set for just a few moments to cool and then turned them over and onto a tray. I lifted the pan anticipating the gorgeous caramelized rolls I had seen as a child, but much to my dismay, they were stuck in the pan! The delicious trade mark sauce, was acting as a super brown sugar glue!!! I could do nothing to pry them out!! After that experience I learned to invert the pan immediately! I made them in a ring pan with pecans on the bottom, raisins inside, minis, huge large rolls, anything and everything! Long after Elva passed away and I lived in Saudi, I decided to change her recipe and I made my own version of this dough. I felt that my dough was not as light and fluffy as I wanted, so I dared to make a change! I still want to call it Elva’s recipe because she inspired me to bake and it is based off of her recipe. It is a combination of Elva’s recipe and my own. This post is dedicated to that special woman I called Ma! This dough, like many of my recipes, is dough that is used for dinner rolls, bread sticks, cream cheese rolls, pesto rolls, you get the picture, this is my versatile, go to recipe. Dissolve yeast in 1 cup of warm water, sprinkle with a dash of white sugar and let it set for a couple of minutes until ready. Place 1 cup of water and 1 cup of milk in a sauce pan on the stove. Heat this up on medium until very warm and then turn off heat. Let this cool so that it is warm. Mix shortening, sugar and egg. I use a spoon to mix this because it is such a small amount. Add 2 cups of flour and water-yeast mixture, start mixing with dough hook. Add 2 more cups of flour and start adding some of the water-milk mixture. I alternate adding flour and the milk mixture until both ingredients are gone. Knead the dough with the dough hook or by hand. I like this dough to be sticky (but should be firm enough to work with) this ensures a light roll! So, add just enough flour to make dough workable but still a bit sticky. After kneading is complete, cover dough and let it raise, doubling. Soften butter so that it is not totally melted but soft enough to work with. Use a pan that is heavy duty and not prone to burning, spread butter on the bottom and sides of pan. Sprinkle generously with brown sugar. Divide roll dough into 4 equal parts, take one piece and roll it on a lightly floured surface. Roll dough until an even, round shape has formed. Spread several spoons of softened butter on the dough evenly, sprinkle with brown sugar. Sprinkle with cinnamon. Roll the dough up tightly. Carefully cut one inch slices of the roll. Place pieces on top of brown sugar in prepared pan. Leave a space in between each roll. Cover and let double. Place rolls in oven and let them bake for 30 minutes or until done. I place them on the bottom rack first to get them brown and then move to the top rack half way through. Remove from oven when the top of rolls are brown and invert onto a tray, plate or dish that will hold the rolls and is larger than the pan rolls are baked in (sauce will drip out so dish should be larger than roll pan). Be careful because brown sugar and butter mixture is hot and will drip out. Let rolls cool until warm and serve.